Another real-life blogger bestie sharing her crazy today is gonna be FUN!! Most of you probably already know my friend, Sheaffer, but in case you don't let me introduce you. Sheaffer is the girl behind Pinterest Told Me To, the blog that takes an outfit from Pinterest and recreates it to make it happen. She shares the best deals and cutest things! She's also one of the funniest people I know. Love getting to do life with this lady!! When I first sat down to create this post, I was like "What in the world am I going to write about? I just don't do that many crazy things.."
Thirty minutes later, and I was pretty sure I needed therapy. I seriously had to make myself stop writing. And I had to regulate my breathing because I was beginning to panic about just how crazy I sounded. And I especially hate the little strings that you have to pull off of them sometimes. When I used to cut them up for Carter, I gagged on more than 1 occasion when pulling off one of those disgusting looking strings. If we're being honest, I just dry heaved thinking about the strings. Sheaffer, are these the banana strings you're talking about??!! hahahaha! Do you know what I hate more than bananas? Oh my goodness, my teeth kind of hurt even just talking about it. I really do HATE cotton. The feel of cotton balls sends shivers up my spine and makes me tilt my head down towards my shoulder. Now, a wet cotton ball, I can deal with that. Like, when removing nail polish, I quickly saturate the nasty little white ball with the nail polish remover, and then I'm okay. But dry cotton balls make me want to come out of my skin. I have to wet that baby before it goes anywhere near my ear. I took sign language in college as an elective because of my major of Communication Sciences and Disorders (to become a Speech-Language Pathologist). In fact, even now when watching t.v., I'll find myself trying to sign the dialogue. I'm not great, but I can definitely sign at the sentence level, and if I had to communicate something important to a deaf person, I could probably do it. If somebody that was actually fluent in sign tried to say something to me, I would have NO IDEA what they were talking about. I'm much better at signing than I am at reading sign. I know every single word to a seriously dirty rap song. I can't even write the title of it here, because even the title is dirty. But I'm telling you, that song has a seriously good beat. I'm going to throw my mom under the bus for this one so y'all will see that I come by my crazy honestly. During my freshman year at OU, we had class sometimes when it was really cold and windy outside. Because OKLAHOMA. You know, the wind comes sweeping down the plains and all. My mom was very concerned about me walking to class with it being SO COLD. So, she did the only logical thing. She called the president of the University. Yep, she flat out dialed up President Boren and let him know that she thought it was too cold for the students to be going to class. I was the QUEEN of prank calling. So I'm really going to let my crazy all hang out now. I used to always be concerned that I had accidentally left a candle burning in the house. Okay, so I still am. And then I was always worried that I hadn't shut the garage door. And now I have this weird fear that I've left water running somewhere in the house. I should probably be medicated. SHEAFFER! I didn't know you did this! I'm not going to name names online, but we have another mutual friend that does this!! I've never drank a cup of hot coffee either. Whenever I'm writing, I often write the incorrect word if it's a homophone. For example, although I of course know that the word "buy" means to make a purchase and that the word "bye" is a common shortened version of "good-bye", I would still write a sentence that said "I want to bye this shirt in all 4 colors." It's incredibly annoying. I most often catch the error when proof reading a post, but sometimes they get buy me. Just kidding with that one. I totally new what I was doing their. But it really is a problem. "I love the print on these shorts so much, but make sure you size down in them. And make sure you call your agent so you will have plenty of insurance in case there is a flash flood." I only made one "B" through 4 years of Undergraduate and 2 years of Graduate School. In fact, I wish I could go back in time and study WAYYYY less and not care about my grades nearly as much. And get this, my only B was in a summer school class at Eastfield community college. I did the EXACT same thing!! I got my only "B" in P.E. for teachers. Are you kidding me?? No joke!! (Before I decided on my major I took two business classes-one I absolutely loved and the other was Macroeconomics. I have NO clue why I didn't drop the class or why I even went. Needless to say I was PUMPED about the only "C" I ever got in college from that class. I was in a country western music video in high school. Because I was on a Country and Western dance team. Thanks for having me Erika and thanks for letting me let my crazy hang out. It's funny, I don't FEEL crazy...but clearly I am. Make sure you go check out Sheaffer's blog at Pinterest Told Me To. You can read Rachel @ Floral and Fudge Blog HERE. You can read Elise @ Cheers Y'all HERE. 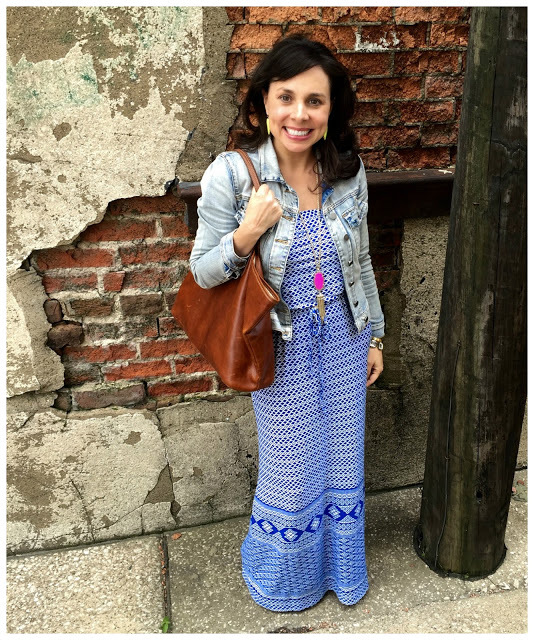 You can read Andrea's @ Momfessionals HERE. You can read Kelly's @ Kelly's Korner HERE. You can read Olivia's @ Snyders Tell All HERE. You can read Narci's @ Grace and Love Blog HERE. You can read Fancy Ashley's HERE. You can read Kelly's @ Redhead on the Run HERE. You can read Shay's @ Mix and Match Mama HERE. I absolutely love this series!!! 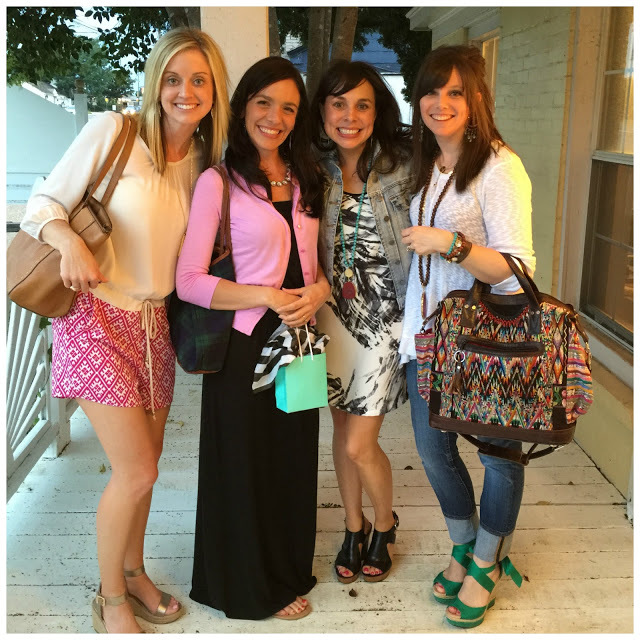 I love seeing blogger's craziness :) Can't wait for the next post on this! This is hilarious to me because 1 - I wish MY mom had called Boren to tell him it was too cold to go to class a few times, because that WIND!! (I have stories about that wind...like the time I was running with my boyfriend/now husband and he decided to spit...and the wind caught that big 'ole spit ball and landed it RIGHT. ON. MY. FACE. I think it was the first time he felt my wrath...and yet he couldn't keep a straight face. He's lucky I married him after that.) And 2 - my husband also went to LHHS and I can remember him telling me about the country and western dance team being "awesome." I thought it was crazy a high school had a country and western dance team, and crazy that my totally NOT country and western boyfriend found it awesome! I love that you were in a country and western dance team! Also, we're getting you a Nutella sandwich this summer! So funny!!! Yep, I'm certifiable! Thanks for having me over here Erika! Love you friend!!! I love this idea! How funny!? I love how we all have little quirks. I totally agree with the candle thing, I always panic if I've blown mine out. I do the same thing with my hair straightener, which I've left on a few times! ah! My mom was the SAME way with cotton balls! When I was little she used to have me pull the cotton out of medicine containers for her and she would run into another room! And I am SO the same way with candles and the garage door...and the coffee pot :) this was such a fun one to read!! I HATE cotton balls as well!! Totally know what you're talking about! You NEED to buy cotton pads to take off your nail polish. They're still cotton-y and scary (hahaha) but 10x better!!!! Finally someone else who hates bananas. Texture is bad, smell is bad, it is all bad. Loved this post! I get you with the sign language..I actually am fluent in British Sign Language.. which is completely different from ASL.. but I find myself signing songs, TV shows etc.. I actually served an 18 month church mission to work with the deaf.. loved every second! Erika!! Me too about macro! For some reason I had to take it for a comm major and I have never worked so hard in my life. It was the most hard earned B I have ever gotten. Erika - I BIG HEART LOVE this series. We all have our oddities, or nicely put, idiosyncrasies. Thanks for sharing Sheaffer! Best thing I've read all day. Just when I think you can't be any funnier I read this! On the sign language thing - I'm kind of the same but with typing. Ever since I took typing class WAY back in the day, I find myself "typing"as I hear conversations ha!! My teeth are hurting thinking about cotton balls and I was about to gag when I was reading about your hate of bananas and then Erika posted that picture and I gagged for real.....disgusting! 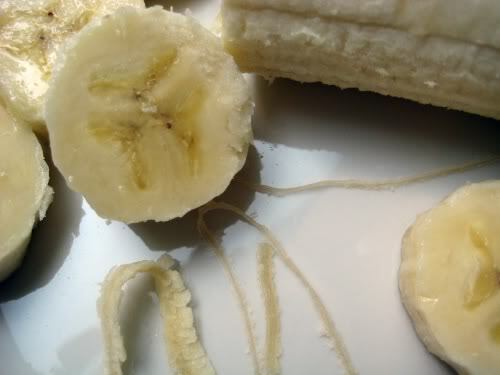 The texture of bananas and those strings on them, I can't even! Oh My Gosh Sheaffer you and the cotton balls!!! I have the same feeling about dry wooden sticks like popsicle sticks, those tongue depressors at the doctor's office and toothpicks. I also feel the same way about newspaper, dry newspaper or any magazine paper that isn't slicky (is that a word?!?!?!) I'm so glad to see other people, COOL PEOPLE have the same freaky phobia thingys like me!!! I am already a big fan of the blog but reading you claim your crazy just made me love you ten times more. I took a sign language class as part of my communication disorders major too and now whenever I hear music I try to sign the lyrics. And definitely if there is a video of your country western dancing you need to share it! Sheaffer's mom must be the reason OU canceled class so easily in the 2007-2010 era... I was at OSU (GO POKES!) and OU ALWAYS was cancelled when it snowed or whatever and we NEVER did. Sheaffer's mom was a helicopter parent before it was cool...haha. And I seriously almost spit my drink about the prank calling in college! I follow her blog but this was hilarious. Love this series Erika! as I was driving to the grocery store which is 30 mins away ( rural living, don't get me started grr)..
Wow, what an intense student! :) I thought she would be more laid back kind of student. I love this series! It always makes me feel better about my quirks. And now I love Sheaffer even more! I just wanted to mention that I went to college at the University of North Dakota, and we went to class in -50 degree windchill. No exaggeration. It was the WORST! Every student on campus knew which route to their classes would give them maximum time inside the buildings/tunnels, never mind which was actually the shortest. I really want to know the rap song because I also know the words to way too many dirty rap songs and it is a fact that shocks people. LOVE this!!!!!! Hilarious....love following ya'll's blogs!! The wonderful Pioneer Woman, Ree, also hates bananas!